Nearly every year, she takes her students to Spain so that they have the opportunity to use their language in authentic context and deepen their cultural understanding. Her students have donated thousands of hours helping local elementary students learn Spanish, and they have established an ongoing e-mail exchange with a middle school in Spain. And, on a recent trip abroad her students met their “keypals” in person. One of her students wrote that Mrs. Bronstein gives every student equal opportunity to succeed and tailors her lessons to help each student grasp the necessary concepts. Another student remarked that she has created outstanding slide shows to benefit each unit of study, and that her son who is an assistant-principal in a New York school discovered that one of his own teachers was using his mother’s slide show. It is obvious to her students and her colleagues that Leni is the ultimate professional. Highly motivated, capable, and conscientious, Leni Bronstein has given much to her students over her long career (1972-present) and has helped to advance the language profession in numerous ways. The winner of the Helen Warriner-Burke FLAVA Distinguished Service Award is Valerie P. Gooss, the Educational Specialist for ESL and World Languages for Henrico County Public Schools. From her classroom and department chair experiences to the position of ESL Coordinator at the Virginia Department of Education and presently Educational Specialist, ESL and World Languages, Valerie has made a huge impact on language study in Virginia. Her nominating letter stated, “Encompassing the belief that the future will be determined by the education that today’s schools provide to tomorrow’s leaders, Valerie has been instrumental in bringing quality, innovative professional preparation programs to world language teachers.” Presenting at the Virginia ESL Supervisor’s Association Annual Conference, facilitating at the 2013 MOPI Training through FLAVA, and serving as a panel member for the VDOE’s Federal Program Coordinator’s Workshop are just a few samples of her leadership and service. Her honors include being named the 2013 Association of Teacher Educators Virginia School/University Partnership Winner and the 2012 Instructional Leader of the Year for Henrico County Public Schools. Earlier in her career, Valerie was nominated by FLAVA for the Florence Steiner Award and was Henrico County’s Gilman Teacher of the Year. In addition, Valerie is quick to share her expertise with other school divisions and has served as an adjunct faculty member at George Mason University and the University of Richmond. She also has served FLAVA as a past-president, awards chair, and presenter and was the 2000 winner of a Best of FLAVA award. Her enthusiasm and commitment to preparing globally-ready world language teachers make Valerie the perfect recipient for this award. The Friend of FLAVA Award recipient is Terrell A. Morgan, Professor of Linguistics, at The Ohio State University in Columbus, Ohio. Dr. Morgan earned his B.A. in Linguistics at the College of William and Mary in Williamsburg, VA, and hence, he continually returns home and supports FLAVA with numerous presentations, including “Those Pesky Native Speakers! (And Why Your Grammar Should Be Like Theirs),” the keynote address at the 2013 FLAVA Conference. Virginia teachers find him passionate about his subject and easy to talk to and generous with his time. After appearing as the keynote speaker at FLAVA in 2013, he stayed an extra day to address local high school students at the invitation of Bruton High School’s Spanish Honor Society. His leadership is exceptional and can be seen in his position as Director of OSU Summer Seminars Abroad for Spanish Teachers (Mexico, Ecuador, Costa Rica, Spain, Dominican Republic, Chile, Paraguay, Guatemala, Bolivia, Nicaragua, Argentina, Peru, and Colombia) since 1991 and as Director of the Ohio Hispanic Heritage Project (OSU) starting in 2013. Dr. Morgan holds membership in nine professional organizations, six of which are life time memberships. He has given over 88 seminars and presentations and has won approximately 35 grants, honors, and awards. Two of those are Ohio State University Professor of the Year and the University-wide Alumni Award for Distinguished Teaching. I have barely touched upon Professor Morgan’s accomplishments as his curriculum vitae is seventeen pages in length. It is obvious that Professor Morgan is not just a “friend” to our state organization, but he has served beyond his community, and his influence is world-wide. has an impressive command of Spanish, Russian and has just started Mandarin. has been the top student in his language classes. In recognition of outstanding academic success and to honor our fallen colleagues, Jamie Bishop and Jocelyne Couture-Nowak of Virginia Tech, FLAVA presents a one year membership to the Jocelyn Couture-Nowak Memorial Scholarship recipient, Laura Froggatt and to the Jamie Bishop Memorial Scholarship recipients, Jeremy Heller, Tyler Weiglein, and Samantha Vasquez. It is our hope to recognize more students in this contest area next year. Descriptive Feedback: A Way to Support Student Learning, Presenters: Inmar Romero, Prince William County Schools; Gimara Richards, Prince William County Schools. Descriptive feedback is one of the most innovative tools in the 21st century to support and enhance student learning. The more students believe in their abilities and skills, the more they are likely to succeed learning a language. In this workshop, attendees will learn how to provide descriptive feedback in order to empower their students to achieve their learning goals. Chester Technical Services, Inc. is the winner of the 2013 Friend of FLAVA Award. Bob Grewal accepted the award in behalf of CTS. 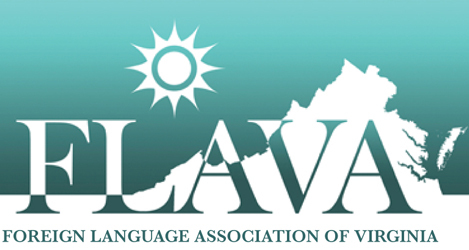 Kathryn Murphy-Judy recently wrote, “As times and te(a)chnologies have changed, CTS has partnered with FLAVA to show Virginia’s teachers how to provide leading edge world language affordances for 21st century learning. The Sony/SANS systems, media services, lab equipment, and furnishings, which many of our schools, colleges and universities use, are an important part of our educational landscape.” Norah Jones wrote in her nomination of CTS, “Patiently and collegially, Chester Technical has been FLAVA’s partner in bringing good quality concepts and products to the attention of annual conference attendees for many years. This partnership has always been in the spirit of support for excellence for both teachers and students, and has therefore made a powerful difference in Virginia’s overall excellence in world language education.” FLAVA looks forward to many more years of support and friendship with Chester Technical Services, Inc. Scholarships: This year’s scholarship winners are Sarah Oertel for the Jocelyne Couture-Norwak Scholarship and Kevin Hopkins, Brian Neel, and Matthew Reihing for the Jamie Bishop Scholarship. Best of FLAVA: The 2013 Best of FLAVA winners are Benjamin Cory Holec and Karine Boulle. Holec, of Norview Middle School,won for “Commodity Wars: Exploring Economies of the Roman World”and will attend NECTFL. Boulle, of St. Anne’s-Belfield School, won for “Turn Students into First Time Authors!” and will attend SCOLT. October 6, 2012 – Laurel Maughan, French teacher at James River High School was named FLAVA Teacher of the Year and received the David E. Cox – Excellence in Teaching K-12 Award. Ironically, Laurel replaced Linda Davidson who retired and received the same FLAVA award a few years ago.Ms. Maughan received a BA in French from the university of Virginia and Masters in Teaching in Foreign Language Secondary Education. She spent spring in 2006, studying French in Lyon, France. She taught in Louisa County High School, the Governor’s French Academy, before going to Chesterfield, County, where she has been teaching upper-level classes in French and she is involved with the AP French Textbook Selection Committee, the Congrès Français, and various other activities that connect students to global and language experiences.In her spare time, Laurel participates in the Richmond Shakespeare Theater group, as an actor and costume designer. nguage profession. She continues: “Recently, she directed a program STARTALK at George Mason University to provide professional development for teachers and supported language proficiency levels into programs that prepare students who are aspiring teachers.Dr. Haley is involved in many committees, boards, task forces and panels to promote high quality teaching. She works tirelessly at the National Board for Professional Teaching Standards, the Northeast Conference on the Teaching of Foreign Languages and ACTFL to support the multiple diversities language teachers face in the Classroom. Her latest publication “Understanding the Perceptions of Arabic and Chinese Teachers toward Transitioning in US Schools” is published in the Language Annals, Vol. 44, No. 2Dr. Halley believes in encouraging thing students to be constantly ‘looking beyond’ the official knowledge being taught, to think in the target language and to know about language and culture.Dr. Yu-Lan LIN, Sr. Program Director/World, for Boston Public Schools, reminded us that Dr. Hall Haley’s teaching, research, publishing, accomplishments and service to the community reach far beyond her immediate circle and have impacted thousands of young minds, teachers and future teachers. She is truly a role model. The Helen Warriner-Burke Award — for Distinguished Service – is awarded to Dr. Amy DeGraff. Dr. DeGraff, has been teaching French since 1978 at Randolph-Macon College. Needless to say, that her influence on curricular development, professional interest in teaching the French language, makes well known by the faculty at RM, as well as her students.Dr. DeGraff, has been Chair of the Romance Language Department, has been Faculty Representative to the President Cabinet at RM.She gave tireless years of Service to FLAVA and AATF. She has been President of the AATF and now Director of the National French Contests for Virginia. Dr. Fabrice Teulon, Associate professor of French and Director of the French Program at VT, enthusiastically support her nomination for the Helen Warriner-Burke Award.Mr. William T. Franz, Provost & Vice President for Academic Affairs, at RMC, said of Dr. DeGraff that she is a gifted teacher, dedicated servant to her disciplinary colleagues, and a decorated educator. Helen Small, Supervisor for World Languages in Newport-News believes that Dr. DeGraff’s contributions over the years cannot be measured simply by the number of committees she has served but by her continuous support of foreign language education. The Awards & Recognition Committee proudly presents the Friends of Education Award to Vista Higher Learning. “VHL is a Friend of FLAVA, and we hope it remains this way,” said Isi. “VHL has been a presenter, exhibiter almost at every conference, providing excellent professional development sessions for the benefit of language teaching and education. VHL is the friend a teacher needs at any time when a great book, language support materials are needed for classroom, teaching and students’ assessment.” Beatriz Gegundez accepted a plaque for VISTA. Vista powerpoint. The Committee is happy to announce that, Lauren Vickers and Josiah Wegner are the winners of the FLAVA 2012 Creative Project Contest.Congratulations to Sharon Boylan Hahnlen, ED, Liberty University and your students! 2012 Jocelyne Couture-Nowak Memorial Scholarship: Elsa Daku. 2012 Jamie Bishop Memorial Scholarship: Margaret Appel-Schumacher, Katherine Eckenfels, Tyler Weiglein. The David Cox FLAVA Excellence in Teaching K-12 Award was awarded to Ms. Gisele Vázquez-Falls. Gisele is a NBCT of Spanish in VA Beach. Teacher of the year, Sponsor of the Spanish Honorary Society, Spanish Cafe and and an Exchange program called “We share one world”. Gisele is a leader in her field and her community, said Dr. Maria Still. She models ‘Best Practices’ in her classroom so that her students can be engaged. Congratulations Gisele! Three retiring Board members, Dr. Linda Szwabowski as the Conference Committee Chair, Nancy Cundiff as Secretary, Sheila Cockeyas Bulletin Editor, each received a plaque representing the Helen Warriner-Burke for Distinguished Service to FLAVA. All three have worked tirelessly for the organization, the community at large, and the World Language profession. They are responsible for many good things that make our world a better place to be. On behalf of the Executive Board, Thank you, from the bottom of our heart! The Marshall Brannon – Excellence in FL Teaching Post-Secondary Award was received by Dr. Lynn Talbot, professor of Spanish in Roanoke College, a veteran professor with exemplary dedication to teaching the Spanish language for many years. She leads the Study Abroad Immersion Program in Argentina, Mexico and Spain. She encourages students to give back to their community. She really makes a real difference in the intellectual development and lives of her students, writes Dr. Charlene Kalinoski. The FLAVA Friends of Education Award was overwhelmingly offered to the Virginia Museum of Fine Arts (VMFA) for their educational, cultural exhibits that benefits teachers, students and the public at large. The VMFA is truly a community partner for World Language and Art Educators. 2011 Jocelyne Couture-Nowak Memorial Scholarship awardee was Sarah Kilbourne. 2011 Jamie Bishop Memorial Scholarship was awarded to Philipp Kotlabaand Nicholas Denny. It is with great pride and joy that I announce Marty Abbott’s appointment as Executive Director of ACTFL: this just days after she addressed us at our conference so thoughtfully and thought-provokingly. I am sending this letter to Marty–originally meaning just to thank her for speaking to us and celebrating with us, but now also to congratulate her on this coup! Determined by evaluations turned in at the end of the conference, we honor three of our presenters as the best presentations at FLAVA. Our congratulations to Shirley, Eugenia and Amy. Shirley Hall (Virginia Beach Schools). Her topic entitled “Timeless Strategies to improve Latin Instruction” looked at various ways to increase critical thinking skills in the Latin classroom and also provides teachers various strategies to help students to write in Latin. “A method of teaching Literary Reading, analysis and Interpretation”. Her workshop, intended for teachers who want to guide students in learning how to read, analyse and interpret literary texts (narrative and poetry), compare them to real life. presented “Promoting Collaboration and Success with Groups” topic geared to learn strategies for grouping students as well as cooperative learning exercises, problem-solving activities and games. The FLAVA “Languages are Timeless” poster contest was won by: Ty’khary Antonio Rawlings (1st place); Amanda Elisabeth Ruck (2nd) and Brionna Nicole Boetger(3rd), all from Francis W. Jones Magnet Middle School, Hampton, under the guidance of their teacher, Ana Estrada. The David Cox FLAVA Excellence in Teaching K-12 Award was awarded to Mamiya Worland. She is a teacher of Japanese at Great Falls Elementary School in Fairfax County. As FLAVA Teacher of the Year (TOY), Mamiya represented FLAVA in the NECTFL TOY competition. The Helen Warriner-Burke FLAVA Distinguished Service was Awarded to Helen Small, specialist for Foreign Languages Office of Standards, Curriculum, and Instruction, The VA Department of Education. Dr. Fabrice Teulon, Professor of French, VA Tech University and President of the AATF Virginia Chapter won the Marshall Brannon FLAVA Award for Excellence in Foreign Language Teaching, Post-Secondary. This award which recognizes a post-secondary foreign language educator who has demonstrated excellence in foreign language teaching was deeply deserved by Fabrice. Not only an excellent classroom teacher who is admired and loved by his students, Fabrice Teulon also has given numerous, high quality sessions at FLAVA over the years treating important topics related to contemporary French culture. In 2007 he was the recipient of the “Best of FLAVA” award. Awarded to the Goethe Institute – For its commitment to Foreign Language education through Seminars, Support, Celebrations and training not only to German educators, also for other European languages. Paula Patrick and VFLSA Members, along with the VDOE Specialist for Foreign Languages at the NADSFL/ACTFL Conference (Right to Left, Paula Patrick, Gregory Jones, Helen Small, and Suzette Wyhs) During the National Association of District Supervisors of Foreign Languages’ fall conference, held in conjunction with the ACTFL conference, in November, Paula Patrick (Coordinator for World Languages, Fairfax County Public Schools) received the NADSFL Supervisor of the Year Award. The award, co-sponsored by Pearson, is presented for outstanding service and leadership at the local, state, regional and national levels, and evidence of continuous professional growth. Paula is the Past President of the VFLSA. We are proud of her distinguished accomplishment and honored to count her among our membership. Congratulations Paula! 2010 Jocelyne Couture-Nowak Memorial Scholarship awardee was Raumi Sidki. 2010 Jamie Bishop Memorial Scholarship went to Tory Smith. The CLTA-VA Professional Development Award is granted to one recipient each year to subsidize his or her participation in the annual meeting in October. Any full-time Chinese language teacher is encouraged to apply. The award is created to enhance professional development for Chinese language teachers who are committed to Chinese language education and are willing to serve the community. This year’s recipient is Tina Gao. After serving in the IT industry for 20 years, Tina Gao joined George Mason High School in 2006 and became a Chinese language teacher. Since then, she has taken on initiatives to promote and enhance the Chinese language and cultures at GMHS and in the community. She has led a China exploration tour and established the very first China Exchange Program in Falls Church, and led the group of students to China for exchange in 2008. The AATSP-VA presented a free membership for 2011 to Sonya Stowe. This is an annual presentation and is part of our fall luncheon meeting. Everyone who is present at the luncheon is eligible to win this wonderful award. Sonya is a relatively new member of our chapter and we are delighted she was at the luncheon and was holding the winning ticket. We know she is happy to have received the membership, worth $65.00, and we are looking forward to seeing her at future chapter events. Determined by evaluations turned in at the end of the conference, we honor three of our presenters as the best presentations at FLAVA. One will go to NECTFL and the others to SCOLT in the spring of 2011, representing FLAVA and presenting their sessions there. The session descriptions from the conference program are below. Our congratulations to Kathryn, Karleesha and Karyn. Join us as we share strategies for maintaining a world language classroom that is structured, engaging, and communicates that students are responsible for their own learning. This could be beneficial particularly for new teachers or even veterans interested in spicing up their lessons. Participants will receive handouts ready to use Monday morning! A discovery of Google beyond “search”: collaborative word processing, spreadsheets, presentation tools, wiki, blog, calendars, chat, wave, and how they all intersect and can serve the world language teacher and learner. Comparable non-Google web 2.0 services will be listed. The David E. Cox Excellence in Teaching K-12 Award goes to Alisa Bearov Landrum, Oscar F. Smith High School, Chesapeake, VA. Alisa switched from a brilliant career as a lawyer to that of World Language educator seven years ago. She sought and obtained National Board certification in 2007 after achieving a 200/200 in her Praxis exam in French. That same year, she held a Fulbright Scholarship to Guadeloupe. Already in 2006, Alisa shone in FLAVA circles, earning the Best of FLAVA for that year. Even in her first year in our ranks, she won the Rookie of the Year Award from Hugo Owens Middle School (2004-2005). Alisa joined the Oscar Smith faculty two years ago and immediately set out to create a “bonjour culture” and increase the visibility of French within the school. Within her first few weeks, Alisa redecorated the foreign language hall with posters and articles promoting the study of French and quotes by famous Americans who had either lived or studied in Paris. She revived the Cercle Français and recently chartered the Société Honoraire de Français, which will have its first induction this spring. Alisa has also been instrumental in promoting National French Week by getting students to broadcast a “French Fun Fact” on our televised morning announcements and publicizing the event throughout the school. The 2009 Business & Industry Award goes to James Kinard of For the Love of Chocolate, an educational taste treat for many of us at 3136 Cary St. in Richmond’s CaryTown area (Phone: 804-359-5645). James has long been more than a friend of World Languages in our area. For many years he has taught Spanish at VCU as an adjunct professor all the while developing his chocolaterie, which has become nearly legendary in the Richmond area. Not only does he carry a delicious selection of sweets from around the world but a walk through the aisles of FLC is a lesson in the global sweet tooth. There are delicacies from every continent but Antarctica! The emphasis, as the store’s name bears out, however, is chocolate. Foreign language educators in the our area can go to FLC to get educational treats for our classes. James always has something significant for various world language learners and he discounts when I tell him it’s for class. So, if it’s Gummibears for German, or Eiffel Tower chocolate squares, or rain forest cocoa, James offers it. The 2009 Jocelyne Couture-Nowak Memorial Scholarship awardee of an annual membership in FLAVA is Kathryn Steele. The 2009 Jamie Bishop awardee of an annual membership in FLAVA is Lisa Cotter. These awards are presented to language majors at Virginia Tech in memory of the two faculty members slain in 2007. Warm Welcome to a new US Citizen! Betty Gegundez and husband, Rubén, on joining us as American citizens, October 8, 2009. Dr. Judith L. Schrum’s academic title is Professor of Spanish and Second Language Education at the Virginia Polytechnic Institute and State University, but the list of her accomplishments and the testimony of the many colleagues, students, and former students who wrote nominating her for the Papalia Award for Excellence in Teacher Education make it clear that she has truly been a mentor, teacher, and leader to all of us in the field of foreign language education. Accepting the ACTFL/NYASFLT Anthony Papalia Award for Excellence in Teacher Education reminds me of my humble beginnings as a teacher of French and Spanish in elementary, middle, and high schools in Kentucky and North Carolina, in suburban and inner city schools during the integration years of the 60’s and 70’s. When I joined ACTFL in those early days of my career, I didn’t realize that I would grow up with ACTFL and with award winners like Anthony Papalia and Wilga Rivers, who shaped the way I taught. At ACTFL conferences and throughout graduate school, Papalia Award winners were the ‘must read’ scholars who shaped the way I thought. To be among them is a cherished honor that, for me, carries a responsibility to continue to inform and be informed, to inspire and be inspired by foreign language professionals everywhere. The FLAVA Executive Board in 2007 voted to rename the FLAVA Awards to honor three of Virginia’s long-standing and highly influential members. The K-12 award is now posthumously named the David Cox Excellence in Teaching K-12 Award, the post-secondary award will heretofore be the Marshall Brannon FLAVA Excellence in Teaching Post-Secondary Award, and for distinguished service we now have theHelen Warriner-Burke FLAVA Distinguished Service Award. We look forward to awarding these latter two in 2008 with Mr. Brannon and Mrs. Warriner Burke presenting to the winners. The 2008 recipient of the Helen Warriner-Burke Distinguished Service Award is Dr. Laura Franklin. Dr. Warriner-Burke reminded all of us of the importance of language education and preparing new generations of teachers and students. Then, she presented the award to Dr. Laura Franklin. Dr. Franklin is a shining example of the best and most dedicated of language professionals in Virginia. Many FLAVA members know her from her cutting edge technology work: since 2000, she has been the co-editor of MERLOT, the leading source of professionally vetted multimedia online resources for learning and online teaching. A veteran language educator, with a BA with distinction from George Washington University in 1979, she went on to get her Masters in 1981 and doctorate in 1989. She has been on the faculty at Northern Virginia Community College since 1992 where she is currently a professor and she also served as Assistant Dean for World Languages. She is the 2009 chair of the Northeast Conference and has been president of our sister organization, GWALT, in addition to memberships in ACTFL, AATF, College Board Testing committees, New Horizons. In addition, she has been awarded the 2008 Innovative Use of MERLOT Award with the Virginia Community College System (and her college, the Northern Virginia Community College was just cited nationally as one of the top three community colleges in instructional technology), 2007 ACTFL/Houghton Mifflin Teaching Languages with Technology with IALLT, Outstanding Faculty Award, State Council of Higher Education for Virginia, Chancellor’s Commonwealth Professor, Virginia Community College System, 1998-2000. She publishes widely and very, very importantly to Virginia Teacher Education has been highly instrumental in the Career Switchers Program for teachers. Where the Virginia Community College System is critical to education today in the Commonwealth, Dr. Franklin, herself is pivotal in the delivery of dual enrollment, career switcher opportunities and technology integration in languages and beyond. Marshall Brannon spoke of his career and the importance of mentoring language colleagues. He then presented Dr. Patricia Cummins with the award. Since finishing her doctorate in 1973 from UNC, Dr. Cummins has participated fully in the teaching ranks as a certified teacher of French-Spanish-English-Social Studies, a college professor, a chair, a dean and a Vice-Provost for Academic Affairs. Even during her years in administration, Dr. Cummins always kept a foot in the classroom. In Virginia since 2000, she has worked tirelessly to articulate LinguaFolio with the Global Language Portfolio and has integrated the Common European Frame of Reference for global validation. Her grant work is helping develop commonly and less commonly taught languages, currently opening doors for Arabic and Chinese studies. She maintains strong links to Business and Professional language uses, not only in her courses and grants but in constantly seeking linkages and opportunities for students. Since coming to Virginia, she has been knighted in the French Order of Palmes Académiques (lifetime achievement award). I cannot even begin to list her grants, awards, publications and many endeavors because they are all so impressive and important. The 2008 recipient of the David Cox Excellence in Teaching K-12 Award is Mrs. Susan Bowman. Last year FLAVA awarded the first David E. Cox FLAVA Excellence in Teaching K-12 Award. This year Mrs. Carolyn Cox, David’s wife, came to recognize the naming of the award in her late husband’s honor and to present the award to the 2008 recipient, Mrs. Susan Bowman of Salem High School in Salem Virginia. Mrs. Bowman who is a graduate of Radford College and has an M.Ed. from the College of William and Mary, teaches Latin and has served in the past as Chair of the Foreign Language Department. She is, notably, also a math teacher. Mrs. Bowman routinely participates in the Latin Immersion weekends, IB training, the governor’s Latin Academy, Alpha Delta Kappa, and numerous statewide, regionaland local Latin and Classical organizations. Yet, it is at the school level where we can really see the heart and soul of her teaching. She runs the Latin Club and the Latin Honor Society in addition to frequent study abroad programs. The next set of awards honors the upcoming generation among whom we hope will come great future language educators: In honor of our slain colleagues from VA Tech, FLAVA has created the Jocelyne Couture-Nowak and Jamie Bishop Scholarships. Each award constitutes a 1-year FLAVA membership and registration for that year’s conference. The 2008 recipients are Rebecca La Creta, Audrey Froelich andElizabeth Potter. Dr. Fabrice Teulon, professor of French from VA Tech accepted the awards in their stead. The final award of the year was the FLAVA grant for National Board Certification applicants for 2008-2009. Isi Kessel explained the importance of National Board Certification for FLAVA Grant National Board Certification for Virginia language educators and named this year’s recipient, Ms. Heather Nolan, who teaches in Henrico County. Determined by evaluations turned in at the end of the conference, we honor two of our presenters as the best presentations at FLAVA. One will go to NECTFL and one to SCOLT in the spring of 2008, representing FLAVA and presenting their sessions there. The session descriptions from the conference program are below. Our congratulations to Cindie and Fabrice! “A Bag of Tricks,” my presentation at FLAVA, is a collection of what one might call “eye”deas (ideas) to get past the use of English in a foreign language class. The “tricks” consist of visuals and manipulatives designed to immediately get the students thinking in the language. They range from simple laminated pictures, phrase lists, and verb charts to a variety of puppets and dolls as well as paper lunch bags filled with pictures of things to eat. Whether the object merely hangs on the wall or is actually placed in a student’s hand, the goal is the same—to eliminate the English footbridge and move him into internalizing the language. These ideas are applicable to any language and lend themselves easily to beginning language concepts or more complex linguistic structures, depending on the needs of the class. Most are quick and easy to pull out for those moments in the lesson where a little more reinforcement or merely a change of pace is needed. My presentation “Virtual Villae: an Interactive Approach to Teaching about Roman Houses” was based on an interactive slide show I developed for my Latin I students. It involves two browsable, hyperlinked slide shows. The first uses photographs, illustrations, animation and text to guide users through an introduction to types of houses and the most famous archeological sites. The second teaches students about Italian geography, rooms of the houses, and customs related to houses by allowing users to build and furnish a virtual Roman house. They begin by picking between properties, then chose a home model and finally furnish each room. Each room sequence begins with a slide giving information about that room and a collage of photos and illustrations from actual houses. In the rooms they can choose from a selection of accurate mosaics and frescoes and then accessorize with furniture (which was hand drawn by me—each piece is based on archeological evidence and was enhanced with realistic textures and patterns using Adobe Photoshop). The show is paired with a catalogue/workbook which prompts the students to answer questions about the rooms while challenging them to complete their house within a set budget.